Contrary to popular belief, the dimpling that characterizes cellulite is almost impossible to get rid of with diet and exercise. If you suffer from cellulite, then you know that it’s not just a matter of eating right or staying fit. Almost anyone can get cellulite—regardless of how much they weigh. It is in fact an almost universal issue, with about 10% of men and over 80-90% of women develop cellulite at least once in their life. Cellulite tends to form around the thighs and buttock region and is almost impossible to hide, making it one of the most frustrating blemishes of all time. Instead of smooth curves and contours, cellulite can make a relatively toned figure look dimpled and unsightly. If cellulite is preventing you from feeling confident it’s time to find a cellulite treatment that truly works. Cellulite is the result of pockets of fat underneath the skin pushing up against connective tissue bands underneath the skin. 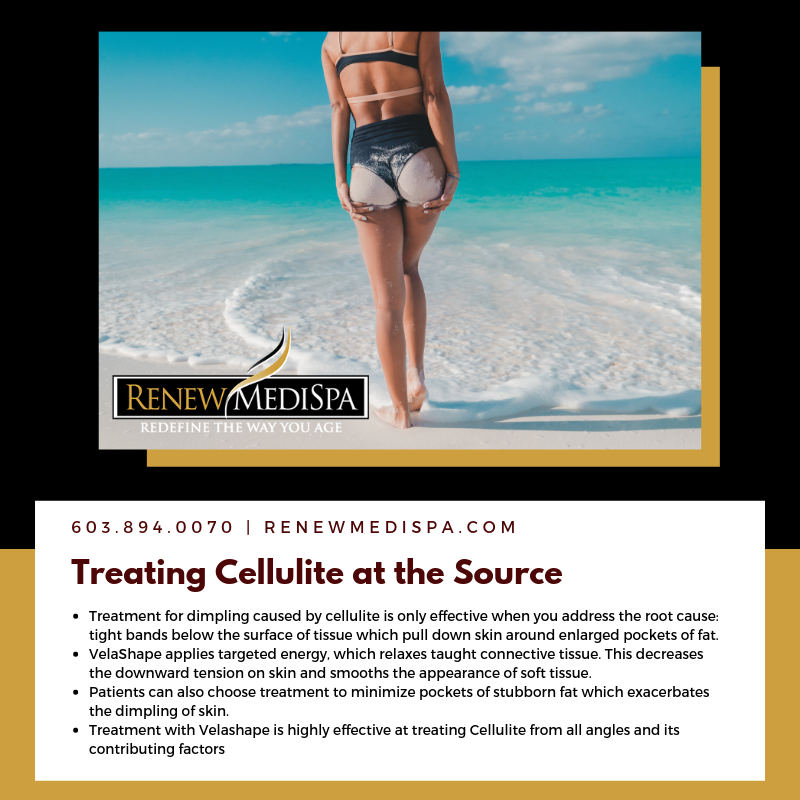 While we’re not entire sure why cellulite occurs, the dimpled look in the skin often occurs in part because of weakened stores of collagen and elastin—the proteins that make up connective tissue. Because of weakened connective tissues in the skin, the fat stored underneath the skin are able to push up and create a lumpy appearance. Factors like aging (leading to a decrease in collagen stores and skin elasticity) and hormonal changes (leading to an increase in stores of fat) have been said to contribute to the development of cellulite. In a single session you can finally erase those buttock and thigh dimples! The longest lasting FDA approved treatment for cellulite- Study data is now available showing persistent resolution of cellulite even 5 years post procedure. The Cellfina® System treats the primary structural cause of cellulite which is the connective bands which exist throughout the fat in the thighs and buttocks. These bands pull down on the skin, creating the puckering you see at the surface. Once released, the skin in the treated area is able to “snap back”, smoothing itself as quickly as three days later. Celfina was FDA approved back in 2015, but at that time only dermatologists and plastic surgeons were able to purchase the device. Dr. Vuich continued to request access, and finally this year the system has become available to advanced service medical spas such as Renew MediSpa. We have a unique advantage as well, as our nurse, Beth Wagner, was a national trainer for this device until she came to work for Renew MediSpa full time. So, needless to say, we have the expert in house! Beth works closely with our Nurse Practitioner Jeanne Goley, to plan and customize your Cellfina treatment, assuring that you have the best result possible. 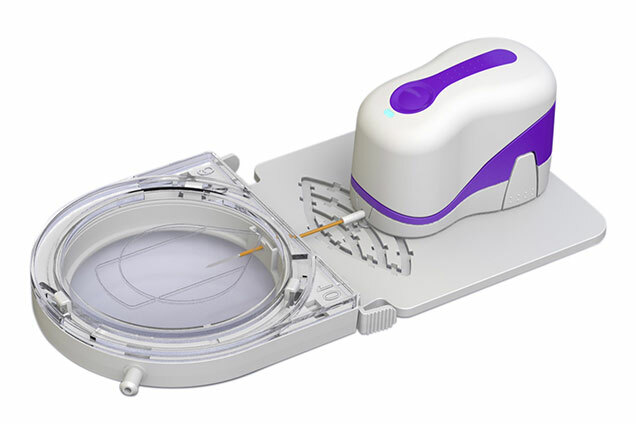 The Cellfina handheld device is used to sever the connective tissue bands which cause the dimples. Each template is sterile, single patient use. After initial photos are complete, the dimples are marked and additional photos are taken to document what will be treated. Local anesthesia is achieved with a very fine needle which delivers lidocaine to the area. If you are uncomfortable during this process, you can take advantage of our Nitrous Oxide system, ProNox. The Cellfina guidance system is placed over the dimple to be treated and vacuum suction is applied. A tiny blade mounted on a motor is used to precisely release the fibrous septae. The procedure takes about one hour, depending on the number of releases needed. You will wear a compression garment, such as Spanx, for a few weeks. You will be instructed as to when you can return to exercise. There is no need to take time off from work. Due to the nature of the procedure being performed, swelling, bruising and soreness are unavoidable and should be expected. Significant improvement can be seen in as little as three days after the treatment. Three years after treatment, 100 percent of Cellfina® Patients still had noticeable improvement on the Global Aesthetic Improvement Scale (GAIS). Results from Cellfina last at least five years – the longest FDA-cleared duration for a cellulite treatment. The cost of Cellfina® Cellulite Treatment varies since severity (number of dimples requiring treatment) varies. You will receive the Cellfina Yearlong Assurance Guarantee . . . if a dimple returns in the same spot, we will retreat the area for free. You may use BlisPay (www.blispay.com) to pay for your Cellfina cellulite treatment, with interest-free financing for 6 months. You may also apply for 12 month interest free financing through Advance Care Card (www.advancecarecard.com). For milder cases of cellulite, we also offer Velashape III. More than 5 million patients worldwide have achieved a sleeker, smoother figure thanks to VelaShape. With over 10,000 procedures performed every day and more than 40 published clinical studies showing its effectiveness, VelaShape has proven itself to be an effective cellulite treatment. We’re proud to offer the latest generation of VelaShape: VelaShape III. VelaShape III is 40% faster than previous incarnations and now features three different tip sizes. With the range of tip sizes, this cellulite treatment can more precisely target the upper arms, neck, tummy, hips, buttocks, thighs, and more. Unlike the single treatment approach with Cellfina, which cuts the connective tissue bands that create the dimples, Velashape treatment shrinks the size of the fat cells and requires a series of treatment sessions as well as periodic maintenance treatments. One measure called the Nurnberger-Muller Cellulite Classification Scale rates the severity of cellulite. There’s three stages: Stage 1 is when dimpling is present when the skin is pinched, but not present when someone’s standing up or lying down. Stage 2 is when dimpling appears whenever a person lies down—but only when they’re laying down. At stage 3, cellulite is present regardless of whether someone is lying down or standing up. The ideal VelaShape patient is someone with a BMI of less than 30, but is classified at stage 1 or 2 in the Nurnberger-Muller Cellulite Classification Scale. It’s important to keep in mind that VelaShape is not a weight loss procedure, but is effective for reducing stubborn pockets of fat that are impervious to diet and exercise. In the end, we’re all different, so the best way to find out if you’re a candidate is to schedule a consultation with the Renew MediSpa staff. Stage 3 cellulite will likely require Celfina. Velashape uses a combination of infrared light, bipolar radiofrequency, and vacuum pressure for its cellulite treatment. To target stubborn pockets of fat underneath the skin, VelaShape’s applicator uses a vacuum to bring the target area closer to the energy source. Then, infrared light is delivered through the skin into the layer of fat while bi-polar radio frequency energy safely distributes the heat, allowing the heat to be effectively delivered without damaging tissues. Of course, stubborn pockets of fat aren’t the only thing responsible for cellulite; that’s why VelaShape’s heating and vacuum mechanism also stimulates the rebuilding of collagen and elastic stores—the proteins that make up connective tissue. With stronger connective tissues, your skin will look tighter, stronger, and have a better texture. Because this procedure approaches cellulite treatment from multiple dimensions, VelShape offers long-lasting, powerful results. Your VelaShape treatment will be simple and comfortable. On the day of the procedure, you’ll lie back as the VelaShape applicator is applied to the treatment area. Your cellulite treatment won’t feel painful at all—in fact, many patients report that VelaShape feels like a warm, deep-tissue massage. VelaShape’s cellulite treatment is completed over a series of 3-6 sessions until they reach satisfactory results. Patients should see their results after 3 sessions. Each session is typically set every two weeks. After the initial series, patients will be able to enjoy its results for 3-4 months. To maintain results lon -term, patients can have 1-2 touchup treatments every three months. Patients will be able to resume their daily activities after their cellulite treatment. Some patients feel warm sensations in the treatment area or reddened skin, but this is only temporary and should go away after a few hours. If you’re interested in learning more about our Cellulite Treatment, call us today to schedule your appointment.